The JEEP® Trailer and Campers are a great alternative for Indiana and Chicago IL RV customers. Maybe right now you don't need a full sized motorhome, but you would like to have something with you while you tackle the open roads. These JEEP® campers have earned the Trail-Rated badge and have undergone more than 300,000 simulated miles on the brutal JEEP® test track! Find out what these models are made of by visiting our Indiana and IL RV dealer, Phillip's RV Sales. The Trail Edition is like having a mini RV and is designed for destination that have an easy access. For example, you could take this to the base of a mountain that you would like your Jeep to climb, and return to it later to camp! This model is built all-aluminum and is lightweight. It offers a 12-inch ground clearance with 32-inch premium brand Radial tires, and trailing arm suspension. The total weight comes to 950lbs. The Trail Edition Camper has a height of 49.5-in and a width of 88-in. Each model comes with a 60-in x 78-in flip-out bed base, a sofa bed, storage area and a table. 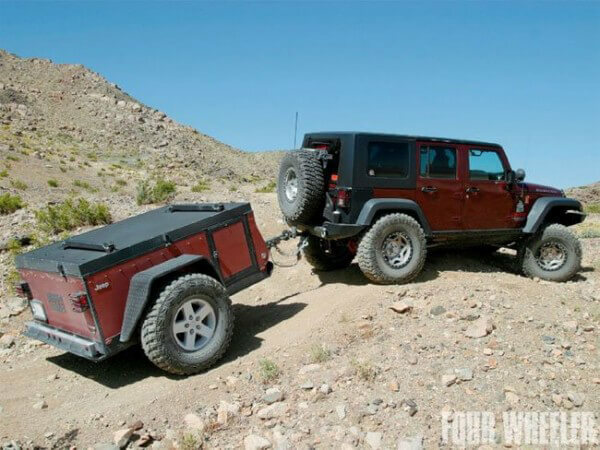 The Extreme version of this Trail Edition camper is the weight. This model still offers the same flip-out bed base, sofa bed, table and storage area. Overall, however, this edition weighs a monstrous 1200 pounds! It has a height of 52-in, width of 88-in and has a ground clearance of 15-in. This may seem like a small difference, but when trekking over rocks and through the serious Indiana and Illinois terrain - it matters. Livin Lite is extremely honored to provide these JEEP® Trailer Camper Rvs to fans around the world. Jeep is famous for their off-road capabilities, and these trail editions make the trips go on for that much longer. Contact our Chicago IL and Indiana area RV dealer at 815-933-2251 to see these models today. Camping is one of the few natural joys in life and Phillip's RV Sales looks forward to enhancing your RV lifestyle, big or small!